"It will take a bit of effort...a bit of sweat and perhaps.....a bit of blood." The influential first film version of Bram Stoker's Dracula almost didn't make it to the present day, which gives us cause to celebrate its presentation on DVD in a new rerelease by Image. The prior 1998 version, now out of print, can be distinguished by the fact that Baron Orlok's face on the cover is black and white (confusingly, it claims on the front to be restored, which is a claim better reserved for the new version); on the new version, catalogue no. ID0277DSDVD, his face is red, white and black. For analysis and comparison of the two versions, see the image review below. Director F.W. Murnau and his associates attempted to avoid paying royalties to Stoker's widow by changing the character names and place names while retaining much of the basic plot. As so often happens when one thinks one is escaping the requirements of the law by being clever, it didn't work. Florence Stoker sued and won, obtaining an order that all prints of the film be destroyed. Luckily, for us today, that didn't work either and at least one export print managed to survive. This presentation includes the Murnau character names, rather than the Stoker names that are used in prints derived from the copy owned by the Museum of Modern Art, and hence these altered names are used in this review. Thomas Hutter (Gustav van Wangenheim) is an up-and-coming young salesman employed by real estate agent Knock (Alexander Granach). The mentor has received a bizarre letter written in some cryptic pseudo-magical script indicating that one Baron Orlok (Max Schreck) from Transylvania desires to buy a deserted house in their city, Wisborg. Hutter is sent to close the deal, but quickly learns that the land of Transylvania is full of superstitions pertaining to vampires and werewolves. Upon reaching Orlok's castle, Hutter also learns that not all is quite right with the Baron: besides looking like a mangy demon from Hell, Orlok also has an unhealthy interest in Hutter's blood, and a picture of Hutter's wife, Ellen. Before long, Orlok is on the move to Wisborg, spreading plague and corpses before him. Certain aspects of Murnau's masterpiece have not held up well over the years. The overdramatic gesticulations and facial expressions strike modern audiences as comical in the extreme. However, the central performance of the aptly-named Schreck never fail to cause one to have the willies. Gaunt beyond words, tall and thin, moving at times as if he is on wheels, Orlok is a truly iconic and unforgettable figure. Few scenes in film are as discomfiting as his predatory walk about the ship that is taking him to Wisborg (never mind that Transylvania to Germany is hardly an ocean voyage). Unfortunately, the one truly ghastly scene, in which Orlok rises from his coffin bolt-upright, is spoiled (as in all video presentations to date) by losing the top half of his head to overscan. While slightly better in this respect than the 1998 release, this still ruins the moment. Windowboxing is a necessity for this film. At times, it seems as if the film is underdeveloped. A Paracelsist professor (John Gottowt), obviously based on Professor Van Helsing, makes a few appearances, but ultimately has nothing to do with the story. Similarly, the subplot with Knock as a mad servant of Orlok has a promising beginning and middle, but goes nowhere as well. Perhaps these omissions were an attempt to fend off the Stoker litigation, but the result feels like padding. The ending is unsatisfying to those expecting a gory stake in the heart, but it does seem more in keeping with the ominous and inexplicit mood of the picture. Image Transfer Review: This remastered version puts the 1998 release to shame. Disc producer David Shepard located a much better source print in the interim, and the new release is quite worth it. What was blurry and murky is now crisp and gorgeous, with an excellent range of greys. At least the first reel or so displays damage in the same places as on the 1998 release, indicating that they once had a common ancestor, but this version is clearly much closer to the source material. An enormous amount of detail which was previously lost is visible here. The walls of the inn can now be seen not to just be dirty, but to have peeling paint. The doors are no longer a uniform grey, but we can see every board and the grain in the boards. Every hair on Ellen is visible, as is her picture in the locket, which is usually lost to contrast. Most frightening of all, Orlok's visage is even more clear and horrifying than ever. The print is run at a proper speed, unlike the godawful sound speed presentation on Elite's Masterworks of German Horror disc (which, because it was a sound print, also cropped off most of the left side of the picture in order to make room for the soundtrack), delicately tinted for maximum effect on the day-for-night sequences. There are still contrast and speckle issues to be seen, and the film desperately needs to be presented windowboxed (far too many heads are cut off at the top, and a few intertitles are lost at the sides), but overall this is not too shabby for a film that wasn't supposed to survive. Audio Transfer Review: In addition to the 2.0 organ score previously presented on the 1998 version of the disc, this revised version also features a DD 5.0 synthesized score by The Silent Orchestra. This new score has plenty of interesting things going on and is suitably unsettling for this film. The surround activity, however, is rather on the disappointing side; it is definitely front-oriented. There are some interesting howling sounds and drumbeats which accompany Orlok's first appearance. No hiss or noise is to be heard, however. The organ score will satisfy those who are after a more traditional presentation; with its extreme bass extension this audio track will rattle the furniture at moderate listening levels. Having a choice between the two versions is a very nice feature which I commend. Extras Review: The principal extra is a full-length commentary by scholar Lokke Heiss. This is the same version that was presented on the earlier release. It contains some useful analysis, especially in connection with the images and themes, but also tends to get bogged down into Freudian analysis which rather stretches the credibility. Still a decent and worthwhile presentation. Also included is a brief piece on the carriage ride to the castle presented in negative, with the film run in positive for comparison, a handful of nasty Expressionist production drawings by Albin Grau, half a dozen stills and a number of posters, as well as the Lubeck newspaper ad for casting 30-50 live rats for filming. Chaptering is still the same inadequate 12 chapters as on the 1998 disc, although this does make A/B comparisons much easier. The notable new feature, the "Nosferatour," is a set of photos of the locations in Lubeck, where Nosferatu was filmed, and the same scenes as they appeared in the film and in period postcards. Interestingly, except for WWII bomb damage, many of the sites are little changed over the intervening years. These are accompanied by narration from Lokke Heiss putting them into perspective and giving additional information. Frankly, I can't imagine what else could have been included beyond biographical information on Murnau and the stars, particularly the mysterious Schreck. 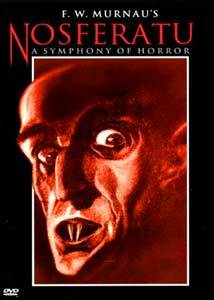 By far the best rendition of Nosferatu to make it to home video to date. Excellent source material and fine scores as well as good extras make this a highly recommended disc.